The Navan Lions Club encourages students to continue their education after graduation from High School. The objective is to award an annual bursary that will encourage a young person involved in the Navan Community to continue with a post-secondary education. The definition of post-secondary education includes college, university and other relevant educational pursuits such as unpaid apprenticeships or internships. The Lions are pleased to announce that the 2018 Herb Deavy bursary was awarded to Takara O'Donoghue at the Ham Dinner in April. Notice to all students registered in post-secondary education; The Herb Deavy Bursary could help you. Each year the Navan Lions Club provides a $500 Bursary to at least one student registered in some form of post-secondary education be it in an apprenticeship, college or university. This Bursary is open to all students in the area served by Navan Lions i.e. from the South of Orleans, to Sarsfield in the east to Vars. In the south, to Bradley Estates in the West. An application form can be completed online by clicking HERE. On May 3, 2002 at its 50th Charter Anniversary, the Navan Lions Club established the Hilda Edwards Award to honour her memory and to recognize her outstanding achievements in musical endeavours and community involvement. The Award is presented to persons sharing these characteristics who are resident or who are active within the area served by the Navan Lions Club. In memory of Hannah Billings - April 29th, 1996 - January 17th, 2007. 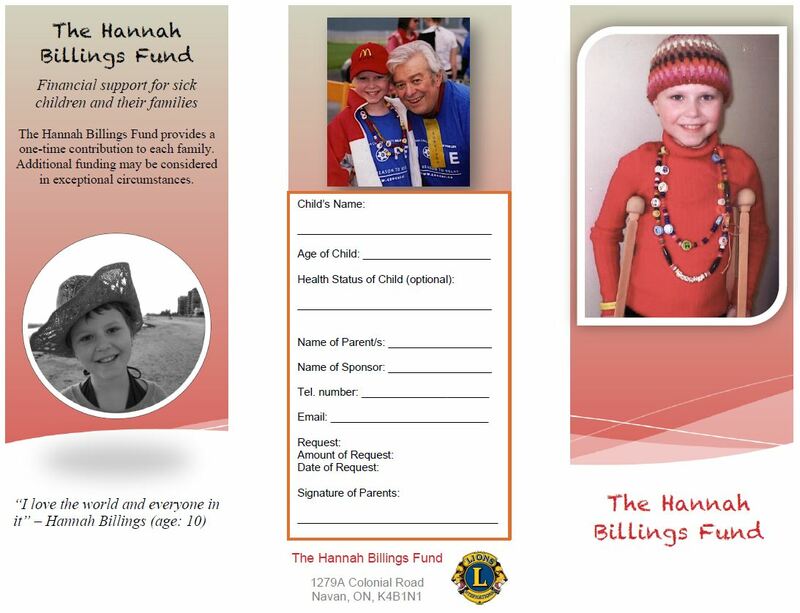 In 2007, at only 10 years of age, Hannah Billings, a child of Navan, passed away after losing a very hard fought battle with Osteosarcoma – (Bone Cancer). 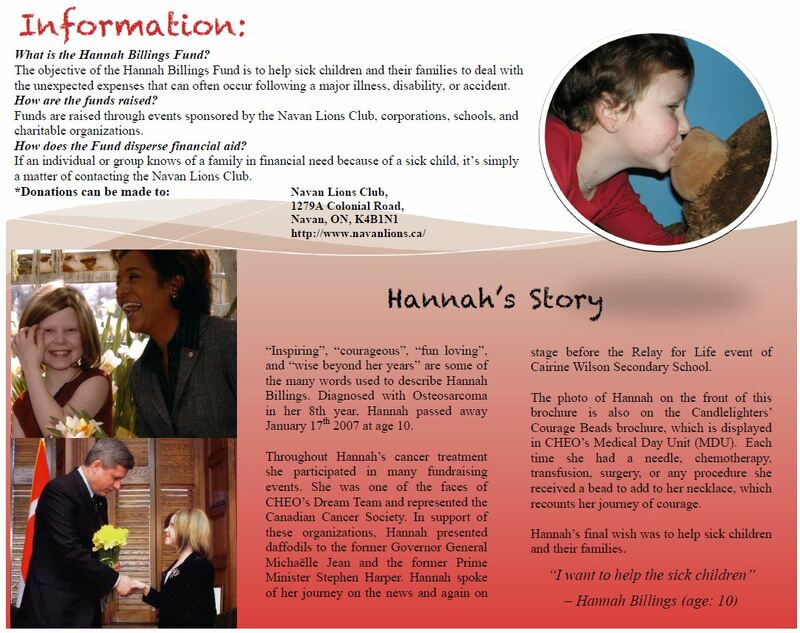 Hannah was one of the faces of the CHEO Dream Team, represented the Canadian Cancer Society and is included in the Candlelighter’s Courage Beads Brochure. She was by any standard a most courageous little girl who went through many many procedures including transfusions, needles, chemotherapy and surgery. At the end of it all her only wish – very clearly expressed - was to help other sick children. Since that time we (The Navan Lions Club and others such as the Navan Women’s Institute, and the Demolition Derby) have been developing a fund in her memory. This fund is specifically for helping sick children and their families deal with the consequences of serious childhood illness or disability. If you are in that position or you know of someone who is dealing with a very sick child – please do get in touch with the Navan Lions Club at 1279A Colonial Road, Navan ON K4B 1N1 – or speak to any member of the Club. All requests will be considered as confidential, and will be evaluated by a small committee which manages the fund with input from Hannah's family. To date the fund has disbursed $36,500 to several needy families to help with their expenses arising from medical emergencies and annual donations to the Cancer Foundation and CHEO Telethons. Fundraising activities include 50-50 Draws, raffles and donations from individuals, Lions Clubs, other service clubs and Womens Institutes. A five year partnership between Canadian Lions and the Canadian Medic-Alert Foundation. The aim is to supply medic alert bracelets or necklaces free of charge to the 300,000 Canadian school children who need one from age 4 to their 14th birthday . All associated fees and expenses are also covered. To date the Club has sponsored the Ottawa Children's Treatment Centre School and in partnership with the Cumberland Lions Club, Heritage Public School in Navan. The plan calls for covering the remaining area schools serving rural students. The Ottawa Children's Treatment Centre (OCTC) is a leader in providing bilingual specialized care for those with multiple physical, developmental, and associated behavioural needs, focusing on our region's children and youth. Find out more about their great work HERE. The Centre got its start in 1951 with a house and $5,000.00 donated by the Ottawa Central Lions Club (Now the Ottawa Vanier Lions Club). Located between CHEO and Rogers House it operated independently for years but has recently integrated its activities within the CHEO organisation. The aim of the Club is to raise the Centres profile in the communities of Eastern Ontario. Lion Hal MacPherson is the District A4 Chair for Lions Services For Children and has been giving talks to other Lions Clubs and organizations promoting OCTC. Anyone wishing to have a guest speaker can contact him at 613-835-3502 or at halnavan@rogers.com.